1.1 The Southwest Monsoon conditions prevailed in the first fortnight of July 2018. During the period, the equatorial region received more rainfall than the other parts of the Southeast Asia in the first week of July. In the second week of the month, with the strengthening of the monsoon winds and movement of the monsoon rain band away from the equatorial region, wetter weather was felt in the northern ASEAN region while the southern ASEAN region transitioned from wet to dry weather conditions by the end of the fortnight. These conditions were consistent with model forecasts, as indicated in the subseasonal outlook for 2 – 16 July 2018. 1.2 During the review period, parts of the Mekong sub-region, including Myanmar, Lao PDR and Viet Nam, received above-normal rainfall. 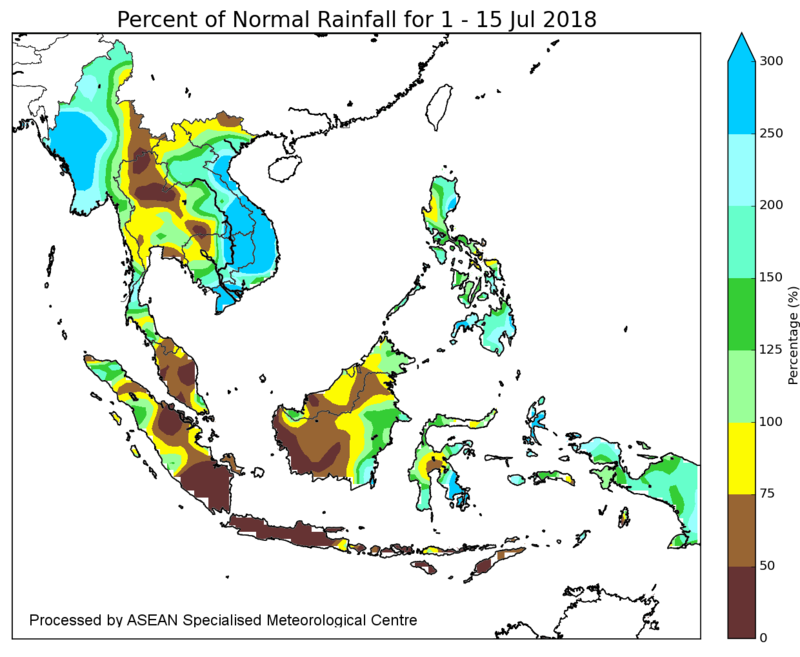 Rainfall was below normal over most parts of the western equatorial Maritime Continent, particularly over Peninsular Malaysia, Sumatra, Java, and West and Central Kalimantan. The rainfall distribution and the percent of normal rainfall for the first fortnight of July 2018 are shown in Figures 1 and 2. 1.3 Stronger-than-usual southwesterly winds prevailed over the northern ASEAN region and the South China Sea. In areas south of the Equator, winds generally blew from the southeast or south, typical of the wind flow for this time of the year. 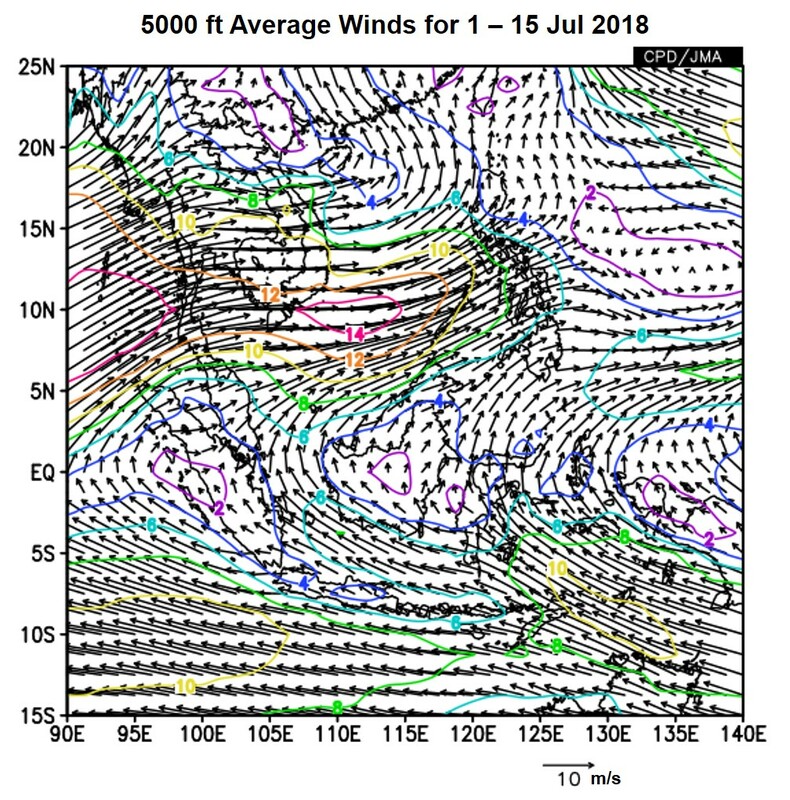 Figure 3 shows the average and anomalous winds at 5000 feet. 1.4 The El Niño-Southern Oscillation (ENSO) remained in the neutral state (neither El Niño nor La Niña). 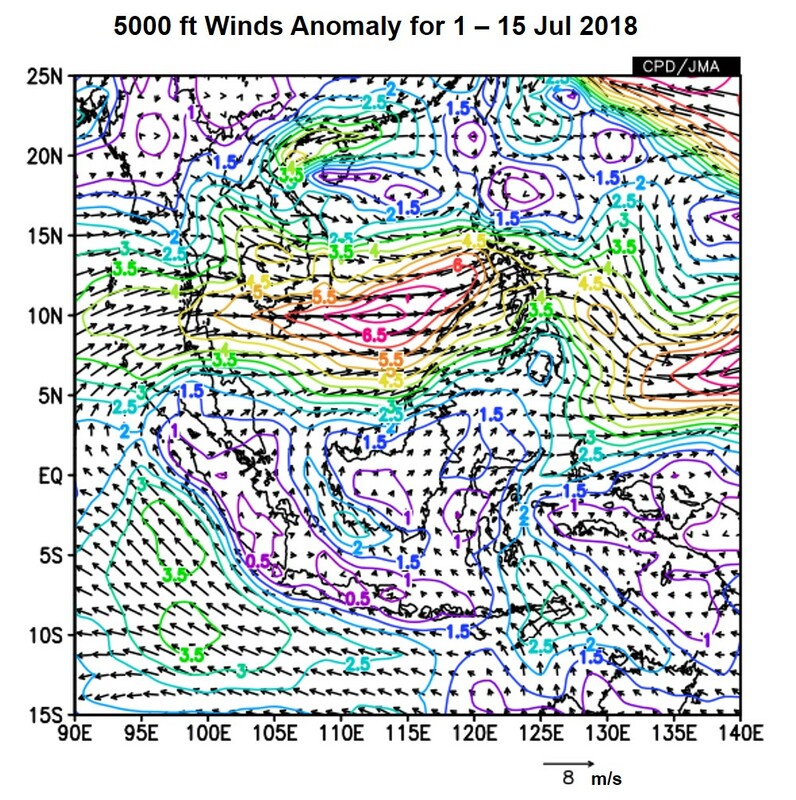 While there were signs of further increase in sea surface temperatures in the eastern Pacific Ocean, other atmospheric indicators continued to show neutral conditions. 1.5 In the second week of July 2018, the Madden Julian Oscillation (MJO) strengthened and progressed through Phases 4 and 5 . While its strength was stronger than expected, its movement was largely in line with model forecasts. 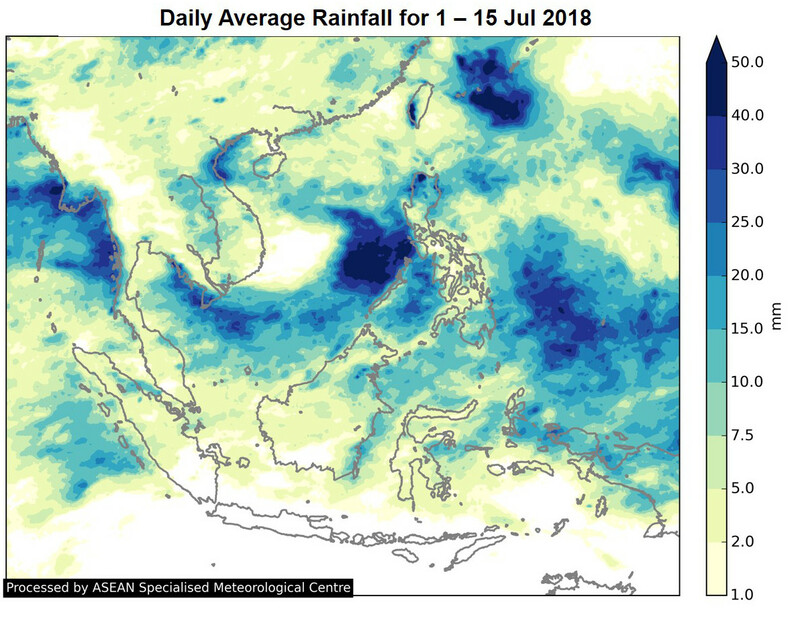 This was consistent with the increased rainfall activities and a strengthening of south-westerly or westerly winds observed over the northern ASEAN region, and the transition from wet to dry conditions over the southern ASEAN region. Figure 4: The MJO phase diagram for June-July 2018 (green for July). 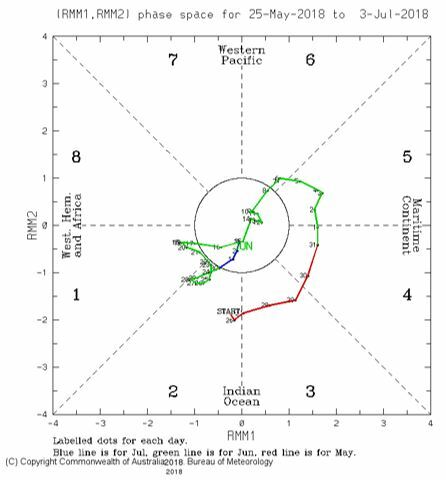 The diagram illustrates the movement of the MJO through different phases, which correspond to different locations along the equator. The distance of the index from the centre of the diagram is correlated with the strength of MJO. When the index falls within the circle, the MJO is considered weak or indiscernible. (Source: Bureau of Meteorology).